Hyundai's new i-oniq concept was designed at the automaker's European research and development center in Rüsselsheim, Germany. Hyundai Motor Co. will preview the next phase of its vehicle styling with a new concept car scheduled to debut at the 2012 Geneva auto show in March. 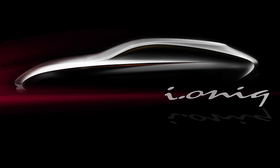 Hyundai released a teaser sketch of the i-oniq concept car that will be introduced in Geneva and said it hints at the future direction of the brand's "fluidic sculpture" styling. The sketch shows the silhouette of a long hood and a fastback-style passenger cabin. The car was designed at Hyundai's European r&d center in Ruesselsheim, Germany. "Two strong arched curves define the silhouette of i-oniq, creating a playful contrast between the sharp character lines and soft but muscular features," Thomas Bürkle, Hyundai's European design chief, describing the i-oniq, said in a statement on Thursday. Hyundai has applied the "fluidic sculpture" styling to nearly its entire vehicle lineup. The swoopy lines and dramatic surface treatments of the corporate look have helped Hyundai shed its legacy of hum-drum styling and boost sales of vehicles like the Sonata and Elantra.